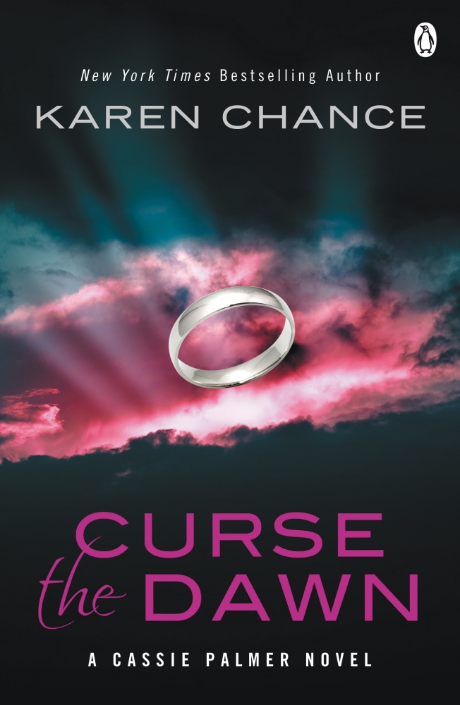 Curse the Dawn by Karen Chance - WARNING! I can’t review this book without spoiling the first three in the series. If you plan on reading this series, don’t read any further! Links to reviews of previous books in the series can be found at the very end. When I read the first book in the Cassie Palmer series, Touch the Dark, I wasn’t too impressed. I enjoyed the plot, the storyline, the action, but it was very much a first book in a series; some things needed to be explained to the reader that Cassie already knew about, which disrupted the story line for several pages at a time, and left me confused. However, I was urged to continue with the series, assured that the series will definitely get better, and so on the assurance of those people, I picked up the next book. And the next. And then this one. Thanks to their encouragement, this series has become one of my favourite urban fantasy series, and Curse the Dawn doesn’t disappoint. Seriously amazing! If you’ve read previous books in the Cassie Palmer series, you’ll know how busy and action packed they are. Amusing as it sounds, the blurb above barely just scratches the surface of what actually happens in this novel. There are some absolutely hilarious scenes in this book because of the body swap situation, and because of all people, it involves Pritkin, but this book is not all laughter. If you thought things had gotten serious in the other books, just you wait until you read Curse the Dawn! Karen Chance never fails to blow me away with how many things can go wrong for Cassie in just one book. If someone was to describe the books to me before I had read them as one dangerous action packed problem followed by yet another dangerous action packed problem, and so on, I don’t think I would have picked them up. I’m generally not a fan of books where so much is going on, they get far too busy, and so very confusing. This is not a problem with these novels; Chance is just incredible at making sure every single detail is important, with things like a tiny little detail from a problem earlier on in the book having a huge impact on something else later in the book. These problems are all connected, and flow seamlessly, and create one amazing story! As I said, things get pretty damn serious in this book. The lives of several characters we’ve come to love are in serious danger, and Cassie is at her wits end trying to make sure that everyone is safe, do her job without any training, and try to work out what a serious of disturbing visions mean, all at the same time. This book is not just the humorous adrenalin rush this series normally is, it’s an emotional rollercoaster when you have no idea how things are going to turn out, and are certain some people will not get out of it alive. I was close to tears at one point, and several times while reading this book, I was sure it was going to be the end of the series; I couldn’t see how there could possibly be a way for there to be a happy ending. And no, I’m not going to tell you if there was or not. Let’s talk characters; Cassie, Mircea, and Pritkin are all back, and how much I love them! Cassie’s narration, with her sense of humour, is always a joy to read, especially when she manages to make some bad situations something to smile over. Mircea is as charming as ever, and Pritkin is as angry as ever, but I wouldn’t have them any other way. There has always been a slight hint of a love triangle possibly raising its head, and after reading this book, if there aren’t any big love triangle issues in the next book, I’ll be gobsmacked. Personally, I’ll be rooting for good ol’ Pritkin. You’ve got to love that guy, even if he does have anger management issues. He does have a softer side, and softer it shines through in this book. We meet several new characters in this book as well, but I have to mention Jonas Marsden, the ex chief of the Silver Circle. He’s a complete nutter, but he’s just awesome! He puts me a lot in the mind of Myrnin from Rachel Caine’s Morganville Vampire series. Marsden is cause for a fair few smiles throughout this novel! I absolutely love this series, and, perhaps because this book was so emotionally, but I felt really quite sad when I reached the last page. I can’t wait to read the fifth book in the series, which is due to be released spring/summer 2010! I’ve caught up at last! Anyone who ignored my warning above and read this review even though they haven’t started the series yet, you really should get to it! The first book can be a little confusing at times, but the ones that follow are just too amazing for words! Get a-reading!